When you have an old or damaged car that you no longer need, the best thing you can do is sell it to a junkyard. Bringing it to a salvage yard guarantees that you will get some money for the vehicle, no matter how badly damaged it is. Keep reading to learn everything you need to know about selling a car to a junkyard. The first step to selling your old junker is finding a salvage yard in your area. 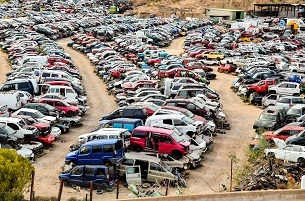 Do some research online to learn about all the junkyards in your area. Be sure to only consider junk yards in Florida where you can easily deliver the car. Read reviews on websites like Yelp to determine if a yard is trustworthy and professional. Contact the junkyards and tell them about the car’s make, model, and condition. They may ask you a few questions and let you know if they’re interested in buying it. Then, they may provide an estimate of how much they will pay you for the car. Consider the offers you receive from each junkyard before agreeing to anything. If you need to tow the car there, keep in mind how much the delivery will cost, too. Once you know where you will sell the vehicle, you can begin preparing it for the sale. Be sure to remove all personal belongings from the car. Check the glove compartment, the center console, and all other cracks and crevices. Throw out any trash and put everything else inside your home. Then, drive or tow the car to the salvage yard you chose. When you arrive, an employee at the junkyard will inspect the vehicle. If it is as you described it, they will give you the amount offered on the phone. If they find additional issues, they will likely offer you less. All that’s left is to sign over the title and receive your payment. Congratulations, you’ve sold your car!